UTAH – White-tailed prairie dogs that live in Coyote Basin in northeastern Utah and Utah prairie dogs are fully protected — you cannot hunt or shoot them, no matter what time of year it is. On April 1, all of the other prairie dogs in Utah will join that protected list for a short period of time. From April 1 to June 15, hunting for Gunnison’s and white-tailed prairie dogs is prohibited on public land across Utah. The closure does not apply to private property, however. On private property, a landowner and those to whom the landowner has given permission can hunt Gunnison’s and white-tailed prairie dogs year-round. A map that shows where Gunnison’s and white-tailed prairie dogs live in Utah is available on page 28 of the 2012–2013 Upland Game and Turkey Guidebook. Tony Wright, a sensitive species biologist with the Division of Wildlife Resources, said the shooting closure has been put in place to help Gunnison’s and white-tailed prairie dogs, which are considered sensitive species in Utah. Wright said many wildlife species depend on prairie dogs for food. “Black-footed ferrets, birds of prey, ground predators — all of these species eat prairie dogs,” he said. Wright said protecting prairie dogs during their spring breeding season is very important. “The shooting closure helps ensure the prairie dogs can give birth to their young and raise their pups successfully,” he said. Utah prairie dogs may not be hunted. Utah prairie dogs live in a large area in southwestern Utah. That area includes all of the state south of Delta and west of Capitol Reef National Park. Utah prairie dogs are fully protected by the Endangered Species Act. Also, you may not hunt white-tailed prairie dogs in Coyote Basin in northeastern Utah. Black-footed ferrets, a federally protected species that lives in the area, feed almost exclusively on white-tailed prairie dogs. Starting June 16, hunting is allowed only for white-tailed and Gunnison’s prairie dogs. In Utah, you’ll find Gunnison’s prairie dogs east of the Colorado River. 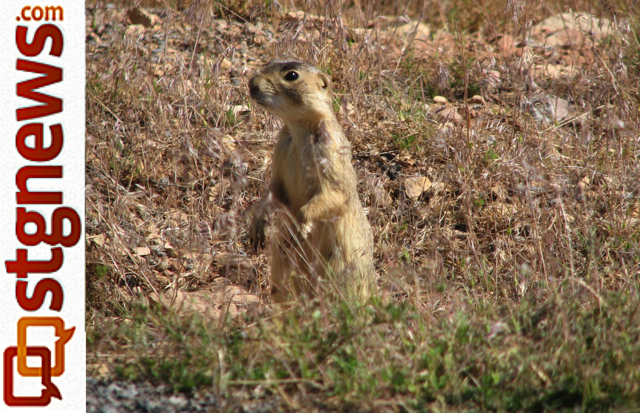 White-tailed prairie dogs are found in other spots in eastern Utah. You don’t need a license to hunt prairie dogs in Utah. And there isn’t a bag limit. Before you pull the trigger, make sure of your target. Burrowing owls and long-billed curlews — birds that may not be hunted — are among the wildlife species that have been killed by people shooting at prairie dogs. Cottontail rabbits — which use the same burrows prairie dogs use — have also been killed by prairie dog shooters. Cottontail rabbits may be taken only during the cottontail rabbit hunting season. The season is held in the fall and winter. Using non-lead ammunition will lessen the chance that birds and animals contract lead poisoning from eating dead prairie dogs. unless hunters use shotgun ammunition, it’s more likely varmit hunter loads are going to go right through, or explode into bits, a dimuniutive praire dog. OK, so we can’t shoot ’em. Then let’s just poison them, and be done with it. Can’t believe the stupidity of putting the lives of pests, above the livelihood of humans. Hey Brian! I know your twin brother, Tom! So, if truth is the greatest pest on earth, then what is you, man? HUH?